I love the breed. I have also cross bred mine to NZ and got a doe that looks like a silver fox. 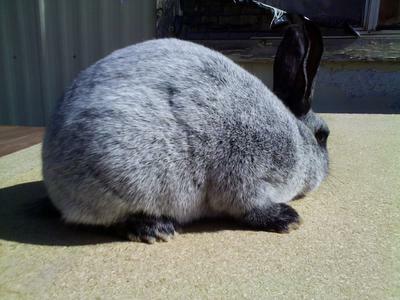 the coat of the mix breed doe is not the same texture as the silver fox of course. I have Champagne D' Argent, New Zealand whites and silver fox and a blue silver fox also. These are beautiful rabbits of yours! 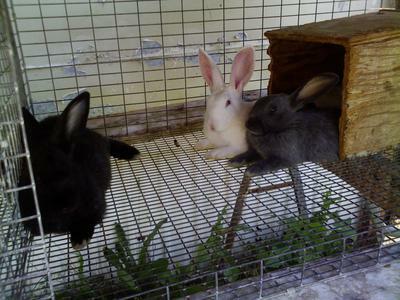 I am very interested that the NZ cross yielded silvered rabbits. Were you aware that it carried a recessive silvering gene? The Champagne d'Argent babies are so cute! You've captured well the transition phase - solid black, but beginning to silver out after 8 weeks or so. 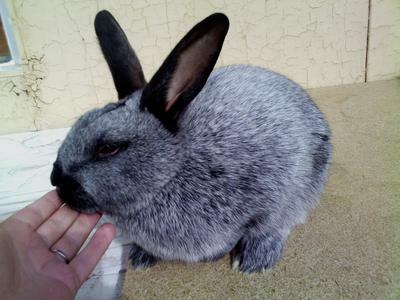 The Champagne d'Argent breed makes a great choice for anyone looking for dual or triple purpose rabbits. And yours look to be very nice examples of the breed. Good job. 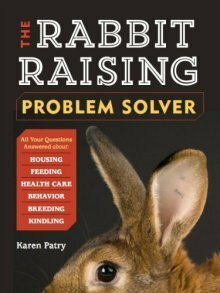 I have owned and bred rabbits for 20 yrs, but it's not till the past couple of years I have started to read about recessive and dominant genes. 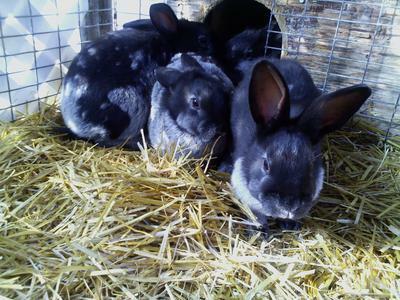 I have always loved taking a couple of very different rabbits, sticking them together and seeing what I get. I also got a chestnut doe out of the champagne/NZ breeding, which I was surprised to see. My next purchase will be a pair of checkered giants and I plan to cross breed them to the Champagne. Don't know what I will get but I will post pics as soon as I can and thank you.